← BOBTV : STORMS ABUJA MARCH 13TH! Tunde kelani still continues with his winning streak of adapted works. His latest movie “MAAMI” (an adapted work from Femi Osofisan’s novel)is still running at the Ozone cinema, Yaba Lagos. The multiple Award winning filmmaker has indubitably craved a niche for himself with the adaptation of literary works. He has commissioned London based Nigerian screenwriter Ade Solanke to adapt the book “Dazzling Mirage” for the cinemas. The author of dazzling mirage, Olayinka Abimbola, is a lecturer in Communication and language Arts, with a PHD in his kitty at the premiere University (Ibadan). The story revolves around a female sickle cell carrier who suffers from the streaming crises that flow ceaselessly into her life as a result of her genes. Betrayal, loyalty, love, and travails, triumphs against the physical pains, emotional trauma are experienced in the life of the sufferer as she forges ahead in the quest to be self fulfilled. 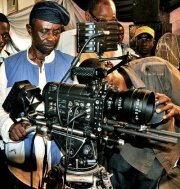 This entry was posted in Uncategorized and tagged author of dazzling mirage, dazzling mirage by olayinka abimbola, olayinka abimbola, tunde kelani, tunde kelani adapts dazzling mirage. Bookmark the permalink. technologies afterward he must be pay a quick visit this website and be up to date every day.